[Image: From “Means to an End” by Dillon Marsh]. There are a few projects by the young South African photographer Dillon Marsh that seem worth a look. Marsh is by no means the first photographer, artist, writer, architect, etc., to look at electricity pylons, but the resulting images are pretty stunning. [Image: From “Limbo” by Dillon Marsh]. The results perhaps recall the “Rise” filter, as well as the square format of Instagram, but, for me, that doesn’t take away from their visual or conceptual interest. [Images: From “Limbo” by Dillon Marsh]. Oddly, these actually remind me of the trees in Hackney, a borough of London where I briefly lived more than a decade ago; the branches of almost every tree along the streets that I walked each morning to the local bus stop had been cut—or hacked, as it were—by the Council, apparently out of a mathematically impossible fear of liability should the branches someday fall and hit a car, a pedestrian, or a baby in a stroller, lending the neighborhood an even drearier feel of grey-skied Gothic horror than it would have had already on its own. Somewhere between portraits and landscape photography, these two projects of Marsh’s go well together, depicting the starkly exposed branching peculiar to these two types of structures. I’ll do one more quick post about Marsh’s work, showing my favorite series of all. "I'll do one more quick post, showing my favorite series of all." It had better be "Assimilation"! Rob, speak of the Devil! 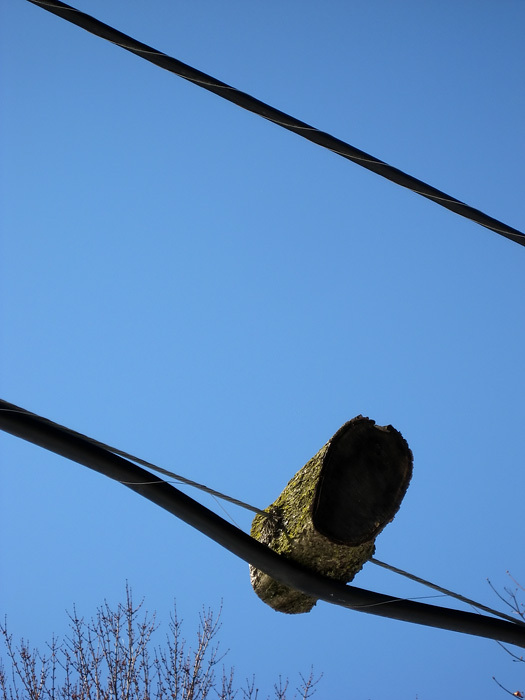 In northern california, where I grew up, a similar fear of falling branches caused some homeowners to top and limb the beautiful redwood trees that grew near their houses, leaving bare reddish-brown trunks sticking straight up like outsized telephone poles up above their houses.